Hi guys, this is another blog post that will teach you how to sell airtime online with the recharge and get paid VTU Business. I will be touching everything about recharge and get paid and how it works plus how to sell airtime online with it while also getting paid doing it. Everyday you recharge your phone, subscribe your cable channels, renew your data plans, pay for utilities, and you don't make money from it, rather you are contributing to the success of those who run these businesses. They are making money and you are losing money which is not too good. So I will be introducing you to recharge and get paid VTU business that will help you in turning the tides the other way round. Now let's take a look at this , the bank make as little as 5% of every recharge you make plus you are still charged for sms alert, so it is when you make use of vendors , quickteller and other processes you make use of when you want to perform these activities. Yet you are on the loosing side. So this has prompted me to write this post on how to sell airtime online with recharge and get paid vtu business . SELL AIRTIME ONLINE: MAKE MONEY WITH RECHARGE AND GET PAID VTU BUSINESS. Now let me start with an introduction to recharge and get paid vtu business. WHAT IS RECHARGE AND GET PAID VTU BUSINESS. Recharge and get paid is a company that is registered with the corporate affairs commission and they also have partnership with the mobile networks in Nigeria( mtn, glo, airtel, 9mobile). Not only that they also have partnership with Dstv, GoTv, and StarTimes. So with the above said you definitely need not anymore proof to know that they are legit. With recharge and get paid you can recharge your lines from RAGP vtu while also getting paid for it. You can also sell recharge card online by recharging for others as you would be acting as a distributor agent. The opportunities are endless when you embrace recharge and get paid vtu business. Next I will be touching everything regarding how it works, the levels and how to join it and start making money from it. You can join recharge and get paid depending on the levels you choose. They have six packages of which you can choose from. The basic package with a start up fee of #5000. The bronze package with a start up fee of #10,000. The silver package with a start up fee of #20,000. The Gold package with a start up fee of #30,000. The diamond package with a start up fee of #40,000. The platinum package with a start up fee of #50,000. These are the packages that you're can register on the program. Each package has its own earning opportunities . You can also upgrade your package anytime you want to. If you are using the basic package, you can decide to upgrade to the silver package which is #20,000. Once you have registered , you also get a PV point(registration bonus) which is 20% of registration being paid. VTU : This is where you control everything that has to do with your account. E-WALLET: This portal is where your earnings are being recorded and you can also decide to cash out yo your bank account from here. LEVEL ONE: You earn 20% percent of all your direct referrals. This includes all referrals you get from all of the six packages. LEVEL TWO: You earn 10% commission from all your indirect referrals referred by your distributors on level 1. This comes from those who are being referred to RAGP by your downlines. LEVEL THREE: You earn 5% commission from this level. This comes from those who are been referred to RAGP by your downlines on level 2. LEVEL FOUR: You earn 2.5% commission for those being referred to the program by your downlines on level 3. LEVEL FIVE: You earn 1.25% from those referred to the program by your downlines on level 4. LEVEL SIX TO TEN: You earn 1% from those being referred to RAGP by your downlines on level 5. These are the levels of earning on recharge and get paid. There is no limit to the amount you can earn on recharge and get paid vtu business. The opportunities are endless ,all you have to do is to be steadfast and being patient enough to start increasing your earnings. Like it is said " an ocean is being formed from little drops of water". So it is in recharge and get paid. 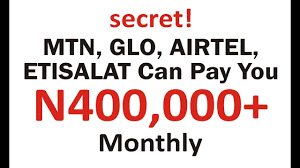 Here is how you can make money by selling airtime on recharge and get paid. After registration you can decide to tell your friends, relatives , business associates about recharge and get paid, and also give them the option of helping them recharge their lines online through the recharge and get paid vtu. Even if you have not referred any distributor you will be paid 2% commission for every recharge of any network you personally buy or the ones you purchase for others. You will be paid 10% of the amount for internet data subscription you personally buy or the one you buy for others. When you refer atleast one distributor, you earn 0.36% of the amount of recharge done by all the distributors in your downline and 1% of the amount of internet data subscriptions done by all the distributors in your downline own line. Being consistent about telling more about it to people will increase your earning and boost your earnings on the long run. Here I will be rounding off my post on how to sell airtime online and make money with recharge and get paid vtu. I will also be writing another post on how to join recharge and get paid , so if you do not want to miss this make sure you subscribe to this blog through the email subscription box. You can also decide to bookmark this blog to get more updates like this. Spread the love by sharing this post if you find it helpful.